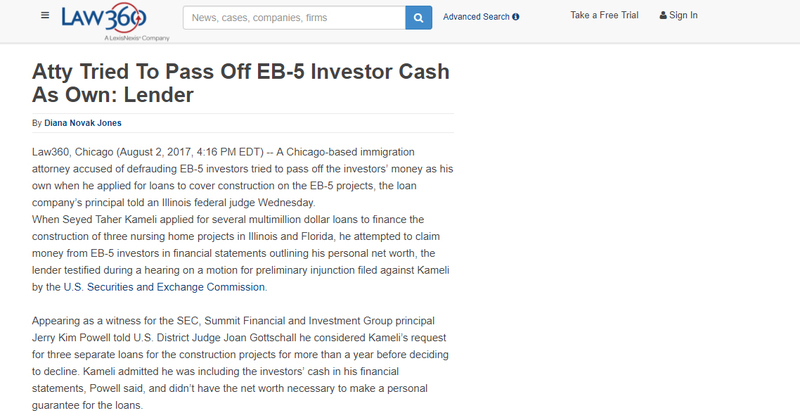 A Chicago-based immigration attorney accused of defrauding EB-5 investors tried to pass off the investors’ money as his own when he applied for loans to cover construction on the EB-5 projects, the loan company’s principal told an Illinois federal judge Wednesday. When Seyed Taher Kameli applied for several multimillion dollar loans to finance the construction of three nursing home projects in Illinois and Florida, he attempted to claim money from EB-5 investors in financial statements outlining his personal net worth, the lender testified during a hearing on a motion for preliminary injunction filed against Kameli by the U.S. Securities and Exchange Commission. Appearing as a witness for the SEC, Summit Financial and Investment Group principal Jerry Kim Powell told U.S. District Judge Joan Gottschall.